To enhance the playing experience we added some unique features. 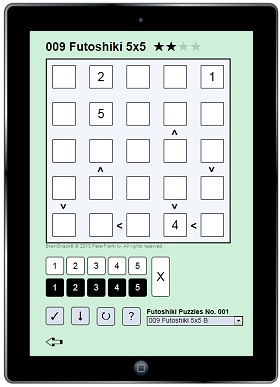 The Sudoku-type puzzles have two rows of keyboard numbers. With the first row you can fill out a solution number in a cell, but with the second row you can insert different numbers in the same cell. This is very useful to keep track of the possible candidates of a cell when solving the harder puzzles. When you check on errors, we will tell you how many errors you made, but it’s up to you to decide if you want to see the errors or not. A die hard puzzler wants to find the solution without any help. 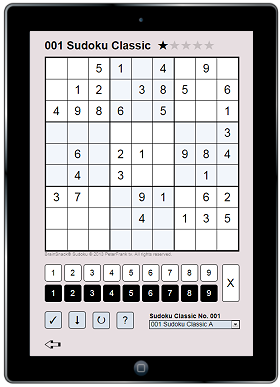 Today we already made five different Sudoku variants: Classic, Symmetric, Sudoku X, Word Sudoku, Horoscope Sudoku and Sudoku Max. 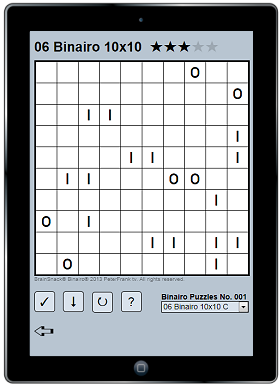 And different grid sizes of Binairo and Futoshiki. To test our digital puzzles, click the links in the menu on the left, or the images on the right. You can also have a look at our Digital Magazines or a newspaper puzzlepage sample with links to the web-Apps.